I have been asked several times in the past few months by consumers and by investors about the Fancy Color Research Foundation (FCRF; www.fcresearch.org), its legitimacy, and its reliability. But before you read on, please note that I have not been endorsed, paid or otherwise compensated in any way, shape or form by the FCRF, its managers or any related party for giving my opinion. Nor have I been compensated by any of its opponents or by any of those who have questioned its legitimacy. This is the exact reason investors contact us at DICE on a regular basis. They know we are here to serve the investment community and not the various large dealers from the diamond industry. All of our opinions and assessments are completely objective and rely entirely on painstakingly gleaned information about the diamond investment world. In fact, it is interesting to note that investors have the real power, and not dealers. In short: dealers would not exist without consumers and investors. Investors and consumers alike can and will survive without the diamond industry (and not the other way around!). I remember being invited by Eden Rachminov to his office a few months ago to discuss the purpose of the FCRF. He took his time to carefully describe the important aspects and benefits of the non for profit organization that he established. He explained the various steps taken to get it going, the amount of data that was collected, the sources for the information, the legitimacy process that the accounting firm took in order to ensure the accuracy of the information as well as the index for the various colors. One of the most important aspects that Eden expressed was the transparency the FCRF wanted to portray of the consumer market on behalf of the diamond industry, which for the longest time, quite the contrary, wanted to remain opaque and closed to outsiders. I was introduced to the team managing the day to day activities of the FCRF, along with a demonstration of the index. I got to input a desired diamond color, clarity and size, after which a graph was produced showing the price performance of the resulting chosen diamond from January 2005 until the latest data elements that were input. I must say, that in one way, it was quite impressive. As critical as I wanted to be about it, and as many claims that I have previously made trying to delegitimize the index, it is, in fact, the best available index, for now. The most obvious claim that I had made was the fact that the FCRF was established by an industry insider. So, is the information biased? On the other hand, it is important to note that if it was not an insider who would initiate such an index, then who really can do it? Only an insider would have intimate access to information from within the industry! 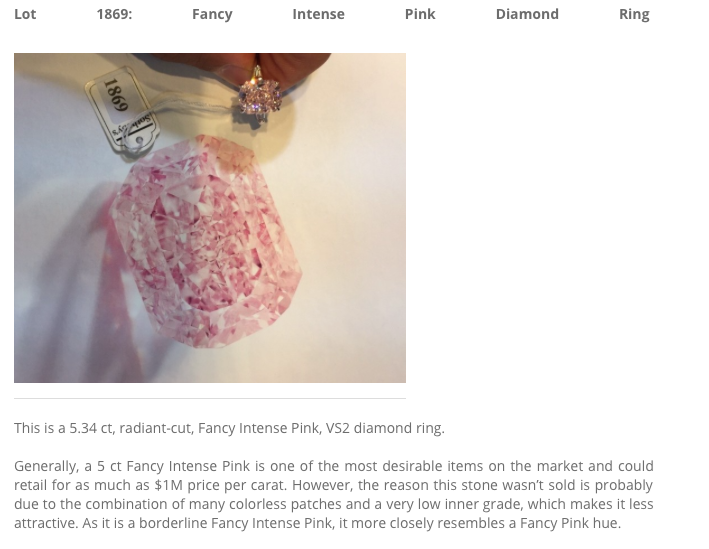 Another important claim that I have made is the fact that the index and corresponding prices represent the wholesale price movements of fancy color diamonds, most notably pink, blue and yellow; the three most desired and traded colors in the industry. The color depths include Fancy, Fancy Intense and Fancy Vivid. Clarities range from IF to SI. Data points represented are 1, 3, 5, and 10 carats, although recently the FCRF introduced 1.5, 2, and 8 carat sizes into the index. In my opinion, the index supports only a certain group of people within the whole value chain, the retail industry (stores). It does not give any price level indications to consumers. However, nothing is perfect. Because of the various markups by different retail stores in the value chain, such as high end designer and brand names but also single owned jewelry shops and chain stores, it would almost be impossible to show further price change to the consumer. Basically, there is nothing else out there to reference so this will have to do for now. Another facet of the legitimacy of the FCRF is the Board to which it answers. I highly doubt that after well over 30 years of being in the business and building one of the world’s strongest brands in fancy color diamonds (Dehres) in the Far East that Ephraim Zion would attach his name to something that would represent anything less than what he himself stands for, and that is integrity. However, it is Eden Rachminov who founded the FCRF while also leading a prominent company, Rachminov Diamonds 1891, a company that was founded many years ago by his family. Rachminov has written and published The Fancy Color Diamond Book, a hard cover well written tome which serves as an excellent and even encyclopedic reference to many in the industry. Another book is scheduled to be published by Eden which will help educate consumers and investors alike that due to the nature of fancy color diamonds, unlike in the world of their colorless cousins, it is OK to own a fancy color diamond that may have florescence or a lower clarity. 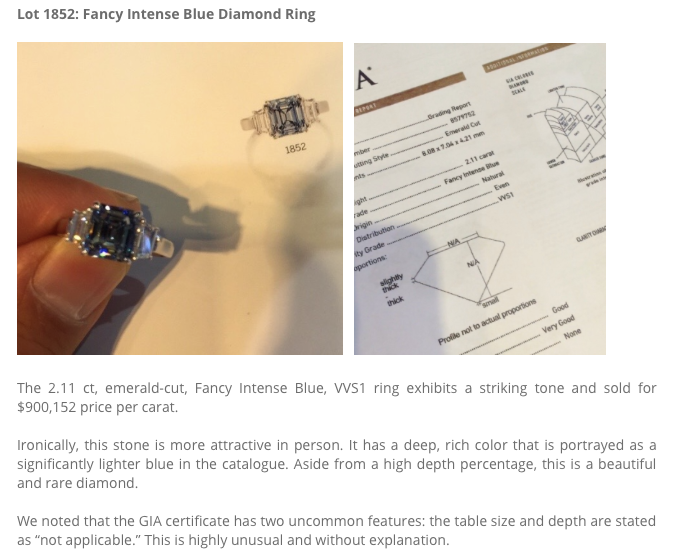 In a way, he is re-educating the market about what is important in fancy color diamonds to help them finally understand it better. Membership is open to all, but the fees to join act to prevent those that would want to join only for fun rather than for its true applications. Potential members would be from the diamond industry as well as any of its important supporting industries such as insurance companies, investment houses, and the media. Some of the notable and select members are: Dior Joaillerie, Tiffany & Co., De Beers Diamond Jewellers, Cartier, Van Cleef & Arpels, and mining companies such as Rio Tinto. Naturally, only those experts dealing with fancy color diamonds on a daily basis can contribute to the implementation of the index. On a quarterly basis, the operators of the FCRF send out a link to various participants, who then have an allotted time slot to enter the various price ranges for various predetermined diamonds with specific characteristics (size, color, intensity, and clarity). Once the final prices are submitted, the FCRF goes to work, gathers all the data entered by industry participants, and then enters it into their index “calculator”, and then out comes the final index. All of the data participants are anonymous, and none of them know who the other contributors are at any given time. This allows the index to remain as legitimate as possible, and prevents any colluding by any contributors (not that I am implying that any of the participants would do such a thing, nor do I even know who they are). 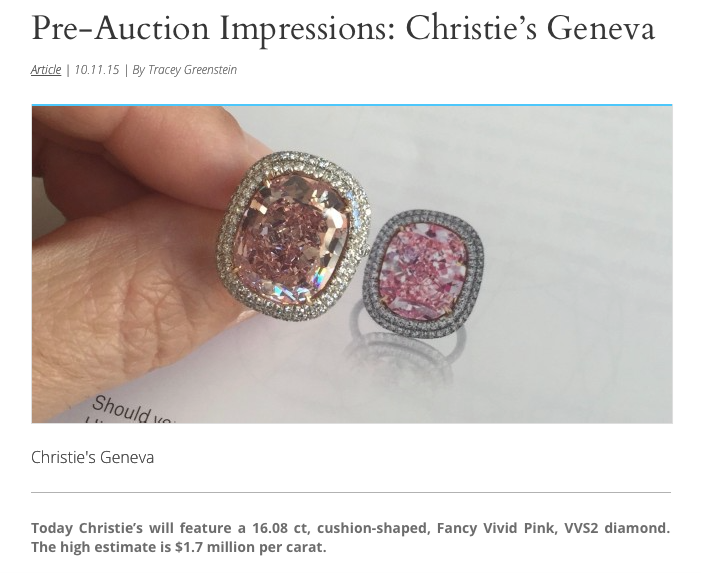 One of the most impressive things that the FCRF does, and which I have not seen any other diamond house or anyone else do are pre-auction impression reviews. 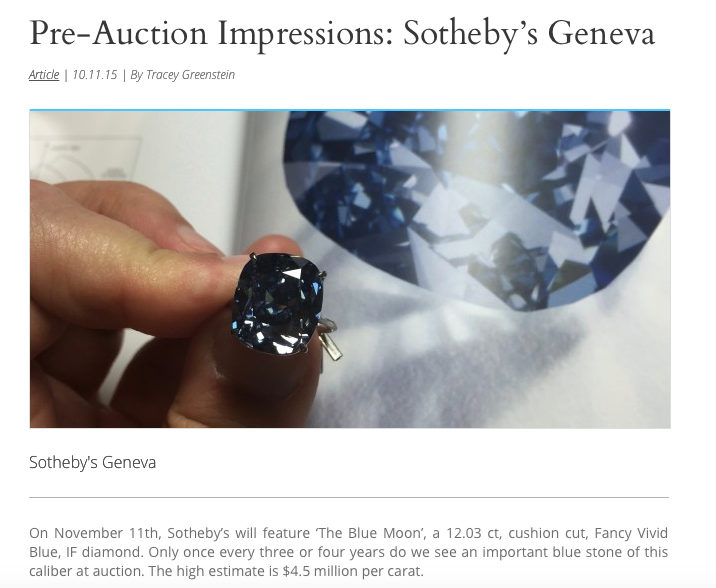 The FCRF does a fantastic job by taking a picture of the actual item at the auction place and places it next to the auction book to show the difference between the actual diamond and the image rendering, which in most cases is Photoshopped (digitally edited) to enhance the item’s look. The above are some images from the FCRF that demonstrate of their hard work to show us the real item compared to the item seen inside the auction book. Pay attention to their comments made. This is where there is a difference between an expert in viewing and assessing diamonds and someone that is not. One of the services that is offered by The Diamond Investment & Intelligence Center is to help individual investors as well institutional ones acquire, manage, dispose of and monetize Investment grade diamonds. While tools like the FCRF index are very helpful to certain retailers and dealers, the average investment professional will not find it extraordinarily useful without a solid background knowledge in historical price statistics and price behavior. Feel free to send us inquiries, or better yet, call us for a consultation to discuss diamonds as investments and what is the right choice for you or your client. Still have questions about the FCRF? Contact us or leave a comment below and we will be happy to address anything that you are still wondering about!